Oh, the glory of the beer ice-cream served at the Cestr restaurant! We love it so much we even included it in our recent list of the best ice-creams in Prague. You see, some things divide, some unite. Cestr's beer ice-cream clearly falls within the latter category: our guests who do not like beer by itself love the ice-cream, anyway, saying they could easily consume beer in this form. First you get the notes of coffee and caramel, just like when you taste the roasted barley that makes the dark lager dark. Then a whiff of honey. And then it comes. The fantastic beer finish that stays in your mouth for a few moments more. It is fun watching our guests go throughout the whole tasting process. 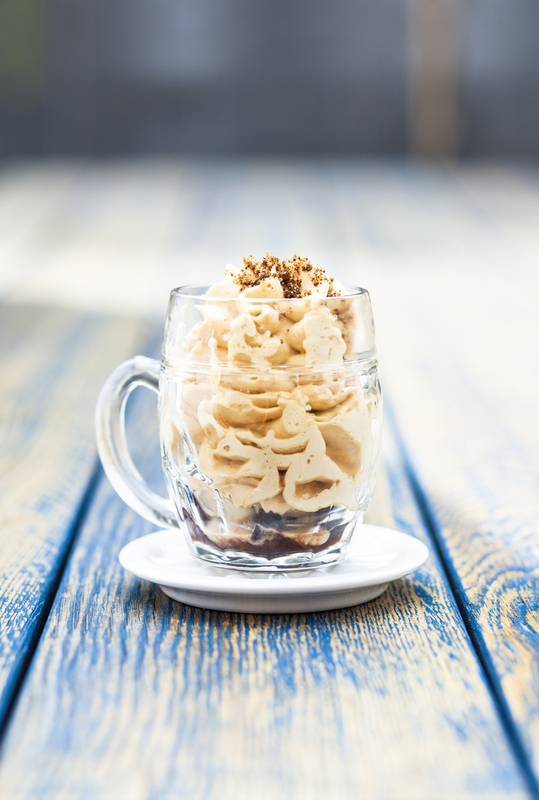 When we first tasted Cestr’s beer ice-cream, we knew we would serve it to our guests. We actually have a confession to make: we bought an ice-cream maker to recreate it at home. We have used it twice, of course. An we failed: ours came out too sweet. And it has been collecting dust ever since. Until now. We have always tried to get the recipe, secretly, but never dared ask. But still, we have been keeping a mailing list of all of our guests who wanted to be sent the recipe when we finally get it. And that means nearly every guest who has ever joined the our Prague food and culture tour. Well, the time has finally come. The Ambiente group of restaurants, the owner of Cestr (and some other restaurants and cafes in Prague) has published the recipe (albeit as part of a larger dessert pictured above) in its quarterly food magazine distributed within its restaurants, and we have the permission to reprint it! So without further ado, here’s the recipe. Put all the ingredients in a pot and slowly bring to boil, stirring occasionally. Sieve through a fine sieve and cool down aggressively (either in an ice-cream maker or in the freezer: in that case, mix the ice-cream through every 15 minutes until it is firm). Did you think it would be harder? We are sorry to disappoint. You can replace the Master dark lager with any dark lager of your choice, preferably from your local small or micro-brewery. Just ask at your local shop that carries beers... and enjoy! In Cestr, they serve the ice-cream with marinated plums, caramel mousse and malt biscuit crumbles. How will you serve yours?